Los Angeles County Fire Department participates in making of SCE's first responder video. Los Angeles County firefighter and SCE staff participate in making of first responder video. Fake smoke billows during filming of SCE's first responder video. Los Angeles County Fire Department participates in making of first responder video with SCE crew. Crew shoots car accident scene for SCE's first responder video. Crews prepare to film SCE's first responder video on a set in Pomona. Los Angeles County Fire Department participates in the making of first responder video with SCE crew. 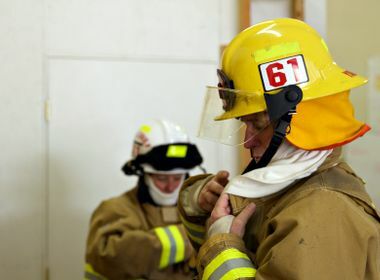 The film aims to highlight electrical hazards during emergency responses. Smoke billows from the front end of a crumpled white Chevy. The driver is slumped over, airbag deployed. The man slowly rises from the steering wheel, and looks toward the firefighters. He is instructed to jump with both feet away from the car while avoiding contact with the car and the ground at the same time and to then shuffle his feet a safe distance away, keeping contact with the ground at all times. After much shuffling, he slumps safely into the firefighter’s arms. Welcome to the filming of ‘Electrical Safety for First Responders,’ the sequel. It is a Hollywood maxim that sequels are never as good as the original. However, this one should prove the exception. 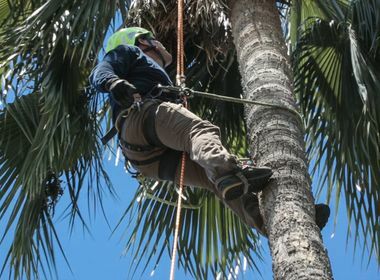 “For one, the production value is much better,” said Troy Whitman, fire management officer with Southern California Edison, who starred in the original and makes a cameo appearance in the sequel. The utility is producing the video to increase awareness of electrical hazards faced by first responders. The first video was produced in 2004 and much has changed since then. The sequel covers old ground as well as new topics like solar panels and energy theft, substation fires and more. The professionally shot video is an effective tool, said Randall Wright, a public information officer with Los Angeles County Fire. County firefighters, along with Los Angeles County Sheriff’s deputies, took part in the making of the video. Electrical hazards are not something first responders encounter every day, but one mistake could prove catastrophic, Wright said. The video is a good reminder of the lurking dangers behind a structure fire or a car accident. 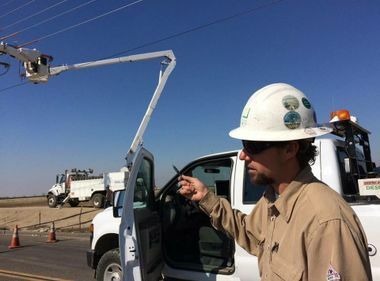 The video will be available to the 1,500 first responder agencies throughout SCE’s 50,000-square-mile service territory early next year, just in time for the El Nino rains and possibly more cars hitting power poles. The shuffling of the feet by the way prevents electricity from travelling through the body.